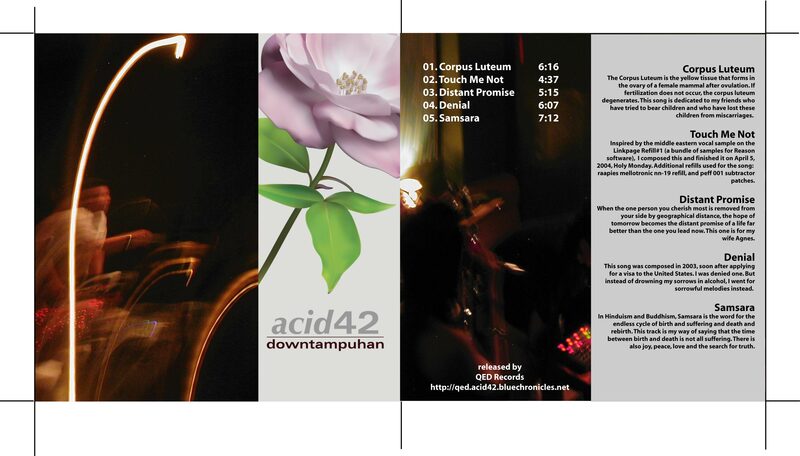 Acid42 (aka Lionel Valdellon) offers his latest downtempo EP which combines chill house, acid jazz, ambient and a little world/ethnic flavor in Downtampuhan, a 5 track output which carries a lot of jazzy electric piano and groovy electronic rhythms. 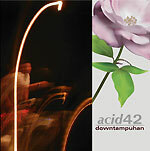 In this EP, Acid42 shares the soundtracks he has created to deal with loss and longing. Individual tracks and the complete liner notes after the jump. The Corpus Luteum is the yellow tissue that forms in the ovary of a female mammal after ovulation. If fertilization does not occur, the corpus luteum degenerates. This song is dedicated to my friends who have tried to bear children and who have lost these children from miscarriages. Inspired by the middle eastern vocal sample on the Linkpage Refill Vol.1 and Raapie’s Mellotronic NN19 refill (a bundle of samples for Reason software), I composed this and finished it on April 5, 2004, Holy Monday. Additional refill used for the song: peff 001 subtractor patches. When the one person you cherish most is removed from your side by geographical distance, the hope of tomorrow becomes the distant promise of a life far better than the one you lead now. This one is for my wife Agnes. This song was composed in 2003, soon after applying for a visa to the United States. I was denied one. But instead of drowning my sorrows in alcohol, I went for sorrowful melodies instead. In Hinduism and Buddhism, Samsara is the word for the endless cycle of birth and suffering and death and rebirth. This track is my way of saying that the time between birth and death is not all suffering. There is also joy, peace, love and the search for truth.